A strange thing happened while the upstart Nissan GT-R campaigned to dethrone stalwart Porsche 911 Turbo as the unofficial ‘king of the super sportscars’: the Japanese newcomer became an old-timer. Has it really been eight years since Nissan’s current halo car first lobbed at the Tokyo motor show in 2007? “The supercar for anyone, anytime, anywhere,” was its tagline at its Australian launch in 2009, the subtext being that it could stand toe-to-toe with Porsche’s luxo-performance flagship, the 911 Turbo, on merit, if at around half the price. Where heroic stats and stopwatches were concerned, it could, though the GT-R just wasn’t that nice, refined or luxurious once the red mist subsided. It was Godzilla, and acted as much even popping down to the shop for milk. Nissan knew it, and spent six years making GT-R more palatable and more potent – even the base version nowadays is called the ‘Premium’. Thing is, Nissan has been massaging essentially the same old car – a car originally benchmarked a decade ago against the previous 996 generation Porsche 911. By the GT-R’s 2007 arrival, Stuttgart had its 997 generation, the Turbo version, as much as any other 911, moving the luxo-performance goalposts markedly. Then in 2012, an all-new, completely revamped 991 911 series arrived, moving Nissan’s aim yet again. Eight years on, the now-ageing GT-R remains the challenger, the now fresh-faced Turbo still the guy to beat. And it seems the collective torchbearers for both may never come to a consensus in the long-standing row where the Nissan camp claims the bang-for-buck victory while Porsche protagonists maintain theirs is the ultimate luxury super sportscar. Enter the current Nissan GT-R Premium Edition and 991 Porsche 911 Turbo. And Nissan claims higher ground as the most powerful and quickest accelerating (claim, to 100km/h) of this pair. Which is great. In the past six years, GT-R pricing has risen. While the base version could be ordered back in 2009 for $148,800, today’s ‘entry-level’ Premium variant, as tested here, wants for $172,000 (plus on-road costs) – some $19,200 pricier than six years ago when the Premium version was top dog. It is, though, $5000 cheaper than the Premium Luxury version (which adds red or ivory leather) and the top-spec Black Edition, which wants for $182,500 (before on-road costs). Our test car too, is free of options. Double the GT-R’s price and you’ll still come up short in meeting the ‘base’ 911 Turbo’s $366,500 asking price. That’s before you add its $22,145 worth of as-tested options that includes Sport Chrono Package ($9680), sunroof ($4990), black wheel paint ($1690), black painted wing mirrors and headlight elements ($1405) and digital radio ($1090). Call it $388,645. But that’s not all the Turbo you can buy: the top-rung Turbo S coupe starts from $444,500. On paper, at least, you can’t get into any 911 for GT-R money. Cayman GTS is the closest Porsche cross-shop on price. So, yes, the base Turbo is pricey. That it commands a markedly lower 50 per cent premium in the higher-volume US ($US101,770 for GT-R Premium, $US151,100 for Turbo) is neither here nor there in this contest where Porsche Australia’s Turbo price reflects what the local market can bear. Regardless of pricing considerations they’re fairly well matched on twin-turbocharged six format and potency, all-wheel-drive motivation, full-fruit equipment levels and, well, approximate performance. We say approximate because while the Turbo’s headlining claim is 0-100km/h in 3.4 seconds (dropping to 3.2sec if you’ve ticked the Sport Chrono option box and activated Sport Plus drive mode), the GT-R counters with a frankly ludicrous 2.7-second claim. While the base Turbo’s 3.8-litre flat six’s tune is 383kW (6000-6500rpm) and 660Nm (1950-5000rpm), its Sport Chrono’s extra 50Nm ‘overboost’ and added launch control smarts milking that extra two-tenths. 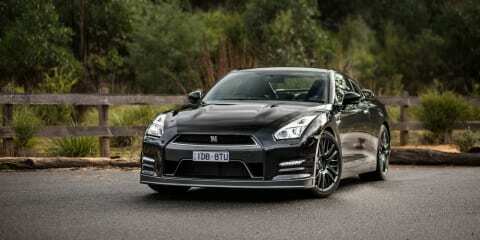 When it first launched in Oz in 2009 boasting 357kW/588Nm, Nissan’s relentless massaging of the GT-R’s hand-built twin-turbocharged 3.8-litre V6 today presents a Porsche-crushing 404kW (6400rpm). The caveat is that, at 628Nm coming on at a high 3200-5800rpm band, it doesn’t have, on paper, the Turbo’s torque or spread. Advantage Nissan… Though it’s tough to see where the GT-R plies its half-second benefit. The Japanese car’s powertrain has also evolved, less in hardware, more in tuning. It channels torque via a transaxle-style six-speed dual-clutch transmission and an adaptive all-wheel-drive system (which splits torque between 0:100 and 50:50 front-rear), backed by a suite of track-friendly differentials, an ageing if military-spec driveline capable of contending with engineers’ unquenchable thirst for engine outputs. The overseer is its Advanced Dynamics Vehicle Control, allowing driver-switchable Normal and R-Mode drive modes suite or individual control of engine, driveline and driver enhancement systems to alter the car’s character. Neat tricks include ‘preselect’ gearchange and rev-matching functionality together with – no prizes for guessing – launch control. The German car uses a seven-speed dual-clutch design together with a dizzying array of software and hardware features to enhance drive and handling. For instance, traction management (PTM) uses a multi-plate clutch plus two electronic systems (auto-braking, anti-slip regulation) to feed torque to the front axle from a permanent rear-driven state. And that’s apart, if linked to, the stability management system (PSM), dynamic chassis control, rear steering system and rear-axle torque-vectoring smarts conspiring to get you through a corner. First, though, you must get there. And the divide between the two is evident even exiting inner Melbourne for the motorway well before any meaningful corner arrives. The Nissan isn’t happy, though it is happier than versions past. Its softest-of-three Comfort damper mode remains utterly ‘sport plus’ firm by other carmakers’ measures, it’s generally jiggly in ride and it thuds and jolts over square-edged road imperfections. Adding animation to mundane driving is the incessant tramlining, its steering tugging off-centre as it negotiates old road surface tyre indentations. That’s despite changes in its bespoke Dunlop SP Sport Maxx GT600 run-flat tyre spec in 2014 aimed at improving ride and stability. The GT-R’s seating is moderately low, the leather reasonably supple, their shape less contoured as they are puffy. Given the whole instrument cluster moves with wheel adjustment, it’s easy to get comfy. You don’t so much ‘climb’ as ‘fall’ into the Porsche, but once inside it’s, well, heaven. It takes little adjustment to find what so many describe as the 911’s renowned ‘perfect’ driving position, all controls falling superbly to hand, maximum comfort measured by unmatchable support everywhere a driver needs it. Though the thrum of the wickedly fat tyres is ever-present, the default ride of its adaptive damper system is sporting, though amazingly compliant given how instantly connected with the road the driver becomes. The all-wheel steering, too, creates a much tighter turning circle than that of the Nissan, and unlike the relative isolation of the GT-R steering, it seems like you can feel vibrations of every small rock transmitted up through the Porsche’s direction finder. Both are effortlessly swift on their feet when on a roll, neither requiring much more than 2000-3000rpm in normal cruising duties. Even with a bit of urban driving mixed in, both returned fuel consumption figures in the mid-10 litres per 100km territory – numbers not far off their makers’ claims. But it’s the fatter and flatter torque curve that makes the Porsche easier to correspond road speed with your right foot. The GT-R, which, like the 911, wants to climb to the top gearbox ratio quickly to achieve best-case fuel consumption, is a bit peakier in engine delivery, having a tendency to lunge with much more than a right foot squeeze. Last year Nissan fiddled with the gearbox and driveline that once whirled and clunked, ‘racecar-like’, so awfully that owners flocked to dealerships demanding they be ‘fixed’. And it still sounds slightly broken. The Porsche’s PDK transmission couldn’t be more different, up- and downshifting with glassy smoothness at any speed, arguably the most refined dual-clutch design out there. Sink the boot and both will arrive at the dark side of any speed limit quick enough to make your head spin if it wasn’t pinned hard against the headrest, though the GT-R needs to be in the mood (called R-Mode). It primes the powertrain – ups revs, sharpens throttle, and sets the gearbox to ‘kill’ – such that every twitch of the right foot creates an explosion of acceleration. Conversely, in Normal drive mode there’s a pause before the action, exacerbated by a gearbox that shuffles sequentially from where it’s been (usually sixth) to where it wants to boogie (often third) slower than you’d ideally want. 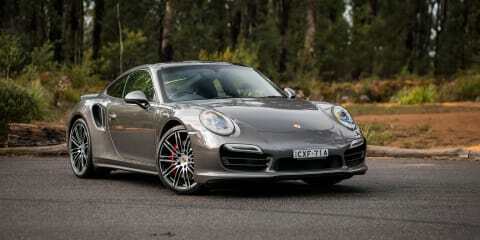 The Porsche is thriftier getting a move on in Normal or Sport, adapting to the driver’s whim with less fuss. But in Sport or over-boosted Sport Plus, like the GT-R, the amount of sheer squirt with about 3000-4000rpm on board is breathtaking. Even at a spirited clip, you rarely harness all the power they deliver. Bar momentary full-throttle plunges exiting tighter corners, neither requires much more than half throttle to be driven quicker than is prudent anywhere other than a racetrack. You’ll be teasing the limits of grip, amply flexing chassis muscles and have their electronic driver aids working overtime all well before either demand their turbo-six necks be fully wrung. Dig deep and, ultimately, the Turbo is the better performer. In measures of pace, it plies its energy to the road more effectively. It’s not simply the torque advantage out of corners, but how its adaptive dynamics package seems more preemptive and precise in shuffling torque between all fours than those of the more reactive GT-R. The GT-R is more animated in corners, wiggling more over bumps, relinquishing tyre grip more suddenly, demanding more driver input to track a line and more correction keeping a true path. If you’ve got the driving skills, it’s an absolute hoot…up until the point when that Porsche Turbo ahead of you disappears into the distance. It becomes clear quite quickly that there’s more to the Turbo’s bag of tricks than mere sheer grip, though with its 245mm front/305mm rear Pirelli footprint to the GT-R’s 255mm front/285mm rear Dunlop combination, it does ply more rubber to terra firma. The Porsche is more squat, feels to have a lower centre of gravity, and sits incredible flat to the road despite allowing the wheels to travel further in the suspension stroke. His feedback on the Porsche couldn’t be more different. “It just takes agility to another level – the four-wheel steering, torque vectoring and stability systems work seamlessly to get all of the power necessary to the ground. The GT-R steering, while direct, drew criticism in the company of the sublimely intimate and engaging Porsche system. “Distant,” was Dave’s description. It also seems that in cool and damp condition, both the Nissan’s brakes and tyres never seem to feel like they’re working quite as sweetly and confidently as they should. At once, the huge gold-coloured Brembos seemed to lack bite and the kind of progression that demands reasonable foot pressure to reward with accuracy. Because the Porsche is friendlier, it doesn’t demand the driver reflexes that the GT-R does. It can be enjoyed while moving oh-so quickly by moderately skilled owners, not merely because it’s incredibly planted and grippy over rough or smooth surface, but because it’s so engaging to drive. Both the steering feedback and front-end grip – at least on poor open roads – is markedly better than the Nissan’s, so you can arrive into corners with more gusto and be confident it’s batting more faithfully for your side once you do. The Turbo cabin is a lovely place to be. Its design, button-festooned centre console apart, is classic Porsche: clean, logical and superbly crafted. But then again, it’s not appreciably more premium than a Boxster at a third of the price, nor any more special than a base 911 Carrera. And while it’s refreshingly free of superfluous excess, charging extra for a reversing camera in a $366,500 sportscar is, frankly, laughable. The GT-R throws a variety of materials and features at its cabin to find its upmarket groove, though not much has been changed in eight years and it’s starting to feel old hat. As Dave remarked, Nissan or not, it’s just not good enough for $172,000, specifically the “Dualis-spec screen”. What it lacks in bona-fide premium feel, though, it makes up for with its whiz-bang Multi-Function Display telemetry system that provides racecar-like real-time diagnostics. Both cars have shortcomings in interfacing their transmissions. The Turbo has handy wheel-mounted paddleshifters that allow gearchanges in any situation but, surprisingly, persists with orienting its console shifter so that forward is for upshifts rather than adhering to the intuitive motorsport convention of back for upshifts. The GT-R, in contrast, mounts its paddle shifters on the steering column rather than wheel, hampering gearchanges when there’s any amount of steering lock on, thus limiting one major benefit of the twin-clutch design. Both cars come with a three-year warranty, though the GT-R’s is capped at 100,000 kilometres. Porsche has a service schedule of 12 months or 15,000km, whichever comes first, that extends for eight years. The first regular service cost $695 and then repeats at intervals every 24 months/30,000km thereafter. An ‘intermediate service’ ($1197.43) is required at 24 months/30,000km and 72 months/90,000km, while a ‘major service’ ($2413.53) arrives at 48 months/60,000km and 96months/120,000km to complete the eight-year schedule. Confession time: I’ve driven both the Turbo and GT-R enough times on track to know that the latter demands a circuit to display its stripes most convincingly. And it’s that almost singular performance focus that has long been the very thing that has presented the Nissan with compromised the levels of livability, comfort and refinement – areas the GT-R still struggles to fully deliver. By attempting to encompass everything from premium luxury to racetrack heroism in three variants separated by little more than seat and wheel trim, the GT-R feels a bit more jack of all trades. In offering some 25 different variants – at last count – Porsche offers a 911 for all occasions, each targeting a niche with consummate precision. And the Turbo leaves the endearing impression that it has been engineered and tuned as the finest super grand tourer without compromise. The only area the GT-R trumps the Turbo is on bang for buck. Not only is this current-gen Godzilla unchallenged for performance for its price, driven in isolation its all-round super grand touring credentials are hugely impressive. But the presence of the fresher and fitter Turbo makes the Nissan feel a little old hat. Yes, the Turbo is wildly expensive. Yes, you could land both a GT-R and some other properly premium grand tourer in the garage for Turbo money. But you do climb out of the Porsche wondering where you could possibly improve it. And wonder why you’d ever pay the extra for a Turbo S.
One thing remains unchanged in all of this: the Nissan GT-R is still the challenger to the ‘king’ of the super GT crown that the Porsche 911 Turbo continues to defend. Click on the Photos tab for more Nissan GT-R and Porsche 911 Turbo images by Tom Fraser.